I have a very similar recipe to this one. 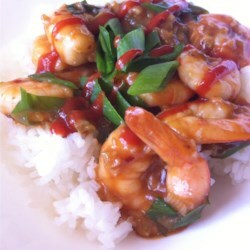 It calls for 1 lb shrimp, fresh ginger, garlic, Tbsp rice wine & I add one can chopped stewed tomatoes. It doesn't really need the honey because the stewed tomatoes give it sweetness. Served with rice this recipe with these additions makes it 5 stars & a wonderful meal for family or guests. You won't have any leftovers !